I am in the process of purchasing a 1972 Mach 1 H code glow gold Mustang. It has a clutch pedal which to me seems off for an H code car. The door tag is missing. Waiting on the Marti report. It has a 351 W with an auto in it right now. Going to restore it back to almost original. I have a 71 4V Cleveland to go into it. Welcome from Amsterdam, the Netherlands! Can’t believe you find cars like this like that... How long has it been sitting? is that how u found the car.. in a leaf pile ?? If it was ordered with a 351 2 V the standard trans was a manual 3 speed. 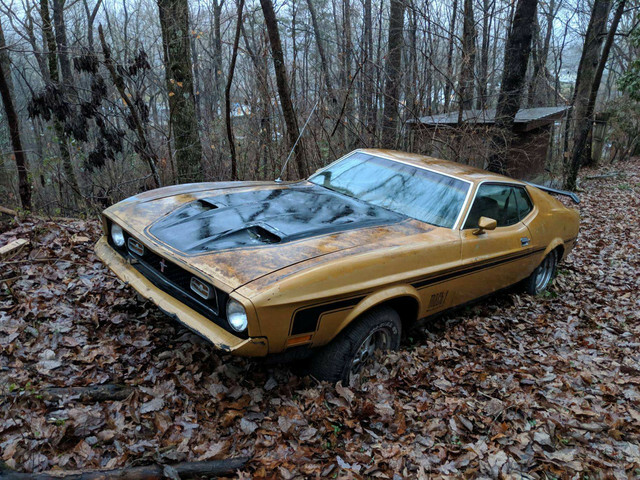 (01-26-2019, 11:46 AM)Bruce180vf Wrote: I am in the process of purchasing a 1972 Mach 1 H code glow gold Mustang. It has a clutch pedal which to me seems off for an H code car. The door tag is missing. Waiting on the Marti report. It has a 351 W with an auto in it right now. Going to restore it back to almost original. I have a 71 4V Cleveland to go into it. Hello Bruce and welcome from Southern Indiana. You must be fairly close to me. Let me know if I can be of assistance in your restoration. I also have a gold glow 73 Q code automatic. Still gathering parts and pieces. Welcome to the herd from North Carolina. Only two transmissions for H code in 72 was 3 speed and FMX auto. 936 FB and Mach 1 made with 3 speed. I parted out a vert that was 3 speed they only made 82 of them. I do have the three speed out of it if interested.